The earliest and most important settlement north of the Missouri River is Saint Charles, originally known as Les Petite Côtes or the Little Hills. Contemporaries of Louis Blanchette stated that he and his wife Tuhomehenga, either an Osage or Pawnee who later took the name Angelique had settled along a spring fed creek [which now bears his name] in 1769. At that time the district of St. Charles embraced all the territory with the limits of the Spanish boundaries north of the Missouri River. The village was situated at the foot of a range of small hills, sufficiently high to protect it from the overflows of the Missouri. Historian Kate Gregg’s research differed a little as she stated: The first settler in St. Charles, and probably the first one to build a mill north of the Missouri was Louis Blanchette le Chasseur (the hunter), who came to live at the foot of the river bluffs in 1769, and called them Les Petites Cotes or Little Hills. He established government buildings for the Spanish and a home for himself on what is now Block 20 of St. Charles; and on the stream that runs through it, the very water-course that the Boonslick [Boone’s Lick] Road later followed to the top of the hill, he established what appears to have been the first grist mill. Whatever hauling there may have been to and from his mill must have been, for the most part, between the mill and the village commons lying to the north of the town in the rich prairie; though there is every reason to believe that Blanchette and his neighbors made some kind of a road in getting from the southern part of the village where Blanchette lived, to the less fertile commons lying toward the west. The natural road between the mill and the two commons at the top of the hill was along the little stream which the Boonslick [Boone’s Lick] Road later followed. In 1789, Louis Blanchette, with only four more years to live, sold his land in the southern part of the village to John Coontz, a German,… and he too erected a grist mill on Blanchette Creek, building a dam for it on what is now known as Block 79. 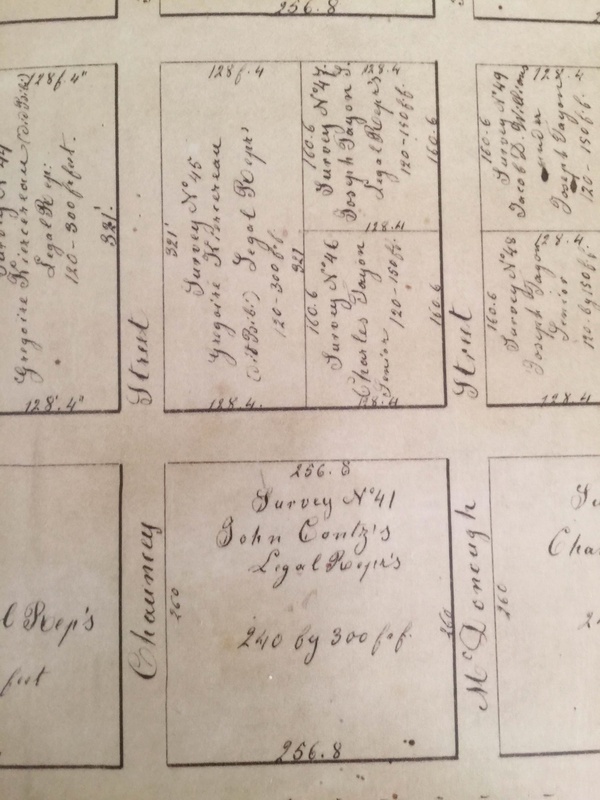 Romain Dufreine, testifiying before Theodore Hunt, Land Commissioner, on May 7, 1825, swore that John Coontz had built his mill on this square thirty years before, i. e., in 1795, and had continued to occupy the land until he moved to the Dardenne ten or twelve years later. Auguste Chouteau made the first survey of the village, under order of the Spanish authorities, but the map of the village, if Chouteau ever made a map, has not been preserved, according to Gabriel La Trail, one of the oldest residents of St. Charles in 1824, who said “he assisted in the survey”. He was one of the principal witnesses before Commissioner Hunt testifying as to the ownership and occupancy of many of the lots of the village. Another who helped with the survey was Louis Barrada Senior. In 1787 the population was said to be eighty families to one hundred families. “The houses, about one hundred in number, in which the four hundred fifty inhabitants lived, were scattered along a single street about one mile long” Even though ‘les Petite Côtes’ (the Little Hills), or San Carlos (Saint Charles) belonged to the Spanish, its inhabitants were mainly French- Canadians. Their occupations were fur trappers, traders and boatmen. They interacted with the Native Americans on a daily basis, intermarried with them, and their cultures combined not clashed. Outsiders considered them poor and indolent, but those that visited and got to know them insisted this was not true. It must have been a picturesque early settlement along the riverfront with the hillsides behind them rising and creating a backdrop for the early log houses, built in the early French style. Today, Block 20 where Blanchette lived , according to an original plat of Saint Charles, is the 900 block of the City of St. Charles’ Main Street, on the east (Missouri River) side of the street. At the bottom is Block 20, showing John Coontz as he still owned it in 1817. From the original plat of St. Charles. Louis Blanchette was a native of the Parish St. Henry, Diocese of Quebec Canada, and a son of Pierre Blanchette and Mary Gensereau. The first in a series we will call STC250 on the Stcharlescountyhistory.org Blog which will feature stories about the fantastic City of St. Charles 250 years.